FILE - A large piece of coral in Queensland, Australia. Some say restoring the Philippines' reefs could contribute $1.5 billion to the country’s economy through tourism and fishing. Devastated coral reefs in the Philippines are sparking an effort to have people rebuild the underwater ecosystems with putty, nails and ‘Filipinnovation’. Researchers estimate that 70 percent of the Philippines’ corals have been damaged, so they are trying to reverse the trend. They're targeting the worst-hit areas by adding coral that has been either farmed or transplanted from more fertile reefs. Nomer Varua is part of a team at Bataan Peninsula State University that’s restoring the reefs, which he says contribute 1.5 billion dollars to his country’s economy through tourism and fishing. The university has teamed up with local and national governments, which provide funding, and the army, which guards areas in need of protection. FILE - A scuba diver swims above a bed of corals off Malaysia's Tioman island in the South China Sea. Varua and his colleagues have not yet determined how their coral nurseries have been affected by the typhoons that hit the Philippines last summer. This is just one of many regions, especially in the Asia-Pacific, where corals are under threat from global warming, fishing with dynamite or poison, pollution, erosion, careless tourism, and coral mining. “Coral reefs have survived tens of thousands of years of natural change, but many of them may not be able to survive the havoc brought by humankind,” the World Wildlife Fund says. Under the so-called “Filipinnovation” program, researchers in the Philippines built 10 metal nurseries that looked like bed frames and covered them with epoxy paint so they wouldn't rust underwater. They attached natural corals and tended to them for months, until they grew 5-6 cm on average. The farmed corals, along with corals that hadn't been cultivated, were then installed in sparse ecosystems using marine putty, nails, and plastic cable ties. About 90 percent of the corals survived, Varua said at the conference, hosted by the Asia-Pacific Chemical, Biological & Environmental Engineering Society. “This innovative nursery and restoration strategy was mostly a theory a decade ago,” the Conservancy says on its website. 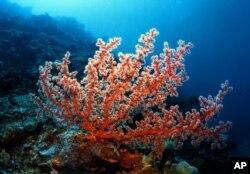 FILE - Researchers estimate that 70 percent of the Philippines’ corals, such as this Gorgonian sea fan, have been damaged. The Nature Conservancy's experiment took place off the Florida Keys, while countries from Australia to Indonesia are testing out their own preservation strategies. In Vietnam, abusive fishing is the main culprit behind coral destruction. Officials have responded by cordoning off certain areas to protect these “rainforests of the sea,” prohibiting coral exploitation and harmful fishing. The United Nations has also recommended that Hanoi treat wastewater and other refuse, engage local communities to pitch in, develop eco-tourism, and replace creatures that prey on corals, like crown-of-thorns starfish, with more beneficial organisms, like urchins and sea snails. Varua and his colleagues have not yet determined how their coral nurseries have been affected by the typhoons that hit the Philippines last summer. Reefs can be decimated by cyclones, but they also can buffer nearby residents from such natural disasters. The team is nevertheless optimistic about the potential of Filipinnovation. “After the completion of this project, it is envisioned that this will jumpstart [a] coral restoration service industry,” the Bataan group wrote in an academic paper.